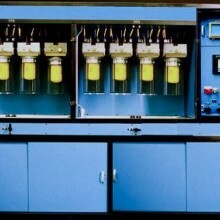 Oil filter capacity, efficiency and containment removal test systems. 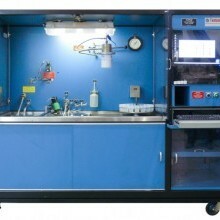 Emprise’s new Pressure Impulse Fatigue Test Stand makes use of modern hydraulic control valve technology to provide a test stand that is simple to operate, accurate, and flexible. 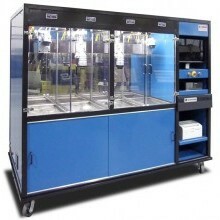 The Impulse Test Stand is designed to test spin-on and cartridge type filter assemblies for their resistance to fatigue failure within their envelopes. Test stand design is based on performing the SAE HS-806 and ISO 4548-5 pressure waveforms but other waveforms are easily run as well. The Impulse Stand is designed to test spin-on filter assemblies for their resistance to fatigue failure within their envelopes. This method complies with SAE HS806 2001 Edition, Section 13.2. Six independent test filter heads test one spin on filter each. If one filter should fail the other filters will continue to run maintaining the same waveform by using a back up filter.